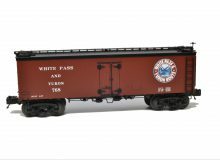 The Canadian Toy Train Association is pleased to announce that MTH is manufacturing a White Pass & Yukon Route 36’ woodsided reefer in their Premier line. This very limited production “O” gauge car comes in two road numbers in 3 rail (#768 & #772). 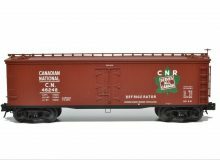 This is the fourth MTH car in our Canadian reefer series and is a limited run. 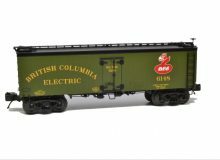 The Canadian Toy Train Association member cost is $ 85.00 CDN per car including shipping within the lower mainland and Vancouver Island. June 27, 2017. The CTTA is proud to announce our first locomotive project! 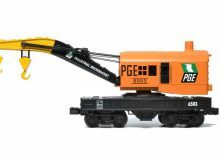 A PGE RS-3 from MTH will be produced in the Railking line. In support of our collection of previous PGE rolling stock, and by popular demand within the CTTA, we’re producing a very limited run of this 1st generation diesel in Pacific Great Eastern livery. This will make it possible for members to compile a complete Pacific Great Eastern freight train. The locomotive will complement the CTTA Club Cars previously released – tankers, reefers, trailer-on-flatcars, hoppers, crane and caboose. 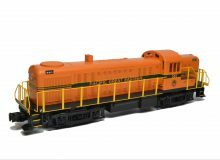 This very limited production “O” gauge diesel comes in two road numbers (#561 and #565) in 3 rail. PGE RS-3 #561 is an operational locomotive and part of the operating fleet at the West Coast Railway Association Heritage Park, in Squamish, BC, near Vancouver. The cost is $ 240.00 US plus $ 30.00 US shipping for a total of $ 270.00 US per engine. This works out to about $ 375.00 CDN, depending on the dollar. Delivery to members was completed in May 2018. If you wish to order, MTH may produce limited quantities of this uncatalogued locomotive for sale at regular price. Check the MTH Web site here. By the time the first RS-3’s rolled off the assembly line in 1950, Alco had refined its road switcher concept to create “a truly universal locomotive which could do anything and go almost anywhere,” in the words of author J.W. Swanson in <i>New Haven Power</i>. In contrast with its predecessor, the 1000 hp RS-1, the 1600 hp RS-3 had all the power of a road diesel of its time and could boil along at up to 80 mph. For awhile in the early 1950’s, ALCO looked like a true contender in the burgeoning road switcher market. RS-3’s could be found on a majority of class one railroads doing everything from switching and transfer duties to mainline freight and even passenger and commuter service. Ultimately, however, the RS-3 took a distant second place to Electro-Motive’s GP7 and GP9 in sales volume. Perhaps what doomed Alco was EMD’s already-commanding lead in the road diesel market – in part because EMD’s FT was the only road diesel allowed to be produced during World War II, when diesels began their takeover of American railroads. Other builders were relegated to producing diesel switchers until the conflict ended. There was also talk that Alcos were less dependable. In hindsight, however, that seems to have been a result of EMD’s sales lead. Perhaps shop crews were simply less familiar with Alco’s model 244 prime mover and how to service it. In fact, roads with primarily Alco fleets, such as the New Haven, found Alco products to be very reliable when maintained properly. With their power and flexibility, RS-3’s proved their worth so successfully that many railroads kept them on active duty after other first-generation diesels had been retired. They survived on class 1 railroads until the Delaware &amp; Hudson retired its last RS-3 in 1986 and remained active in shortline and industrial service for years afterward. The Canadian Toy Train Association is pleased to announce that MTH is manufacturing a Pacific Great Eastern Railway crane in their Railking line. This limited production “O” gauge crane comes in two road numbers in 3 rail. A matching trailing car will follow in the future. Delivery is expected in early 2018. Image shown is pre-production artwork. This is the 4th MTH Club Car produced for CTTA. In celebration of Canada’s 150th birthday, and as a thank you to all the members who continue to support our club, we offered a special price for this crane. Normal CTTA member price would be $ 85.00. Paid up members were offered a maximum of two PGE cranes for the special price of $ 30.00 each, which includes shipping. Atlas O is manufacturing a 55 ton coal hopper in Pacific Great Eastern Railway colors for the CTTA. This is our first hopper car. 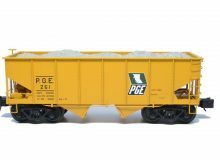 This very limited production “O” gauge hopper car comes in two numbers in both 2 rail and 3 rail. Delivery is expected in summer/fall 2017. Image above shows preliminary artwork for the car. This model features die cast trucks, chassis and center beam, an ABS plastic body, realistic ore load insert, interior separators to add if running the car empty and lots of added detail. 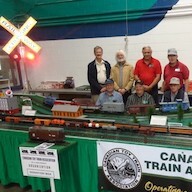 If you are a member of the Canadian Toy Train Association – the cost is $ 85.00 CDN if delivered in BC. Mike’s Train House is manufacturing a prototypical 36′ British Columbia Electric wood sided refrigerator car. This very limited Premier line production “O” gauge Reefer car comes in two road numbers, in 3 rail only. Production is scheduled for Spring of 2017. Image above shows preliminary artwork for the car. 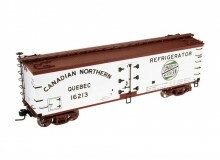 This is the second car in our MTH Premier Canadian reefer car series, and third MTH Canadian Car. This BC Electric Reefer is the 10th car in the Woodside Reefer series. Cost of the car for CTTA members is $85.00 CDN per car; shipping included within the lower mainland and Vancouver Island. Delivery to members and dealers is expected in the Summer of 2017. Atlas O is manufacturing a prototypical single dome 8000 gallon silver tank car for the CTTA in the British American Oil Company ‘bow tie’ logo colors. 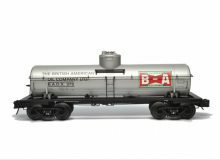 This very limited production ‘O’ gauge tank car comes in four road numbers, in both 2 and 3 rail. Production is scheduled for 2016. 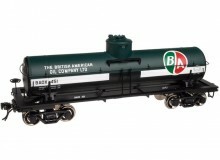 This British American Oil tanker is the 4th car in the series. Features include metal trucks and couplers, stainless steel catwalks, metal chassis, metal ladders and grab rails, and prototypical scheme. Car shown features 3-rail trucks and couplers. 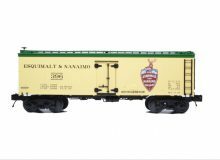 Canadian Toy Train Association is pleased to announce that MTH is manufacturing an Esquimalt & Nanaimo Railway 36’ woodsided reefer in their Premier line. This is the second MTH car in our Canadian Club Cars series. The E&N, which operated on Vancouver Island off of Canada’s west coast, was later acquired by the Canadian Pacific Railway. This very limited production “O” gauge car comes in two road numbers in 3 rail. Delivery is May 2016. The production car shown here. This Esquimalt & Nanaimo Reefer is the 9th car in the Woodside Reefer series. Cost is $ 85.00 CDN or $65 US plus $ 10.00 US shipping; $ 4.00 US shipping per additional car ordered. The Canadian Toy Train Association is pleased to announce that Mike’s Train House is manufacturing a Premier line Pacific Great Eastern offset steel caboose. This is the first ever ‘O’ gauge Club Car to be produced by Mike’s Train House. The production for this caboose will be a very limited run of 112 items, in two road numbers, in 3 rail only. 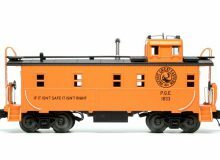 The MTH PGE caboose is based on the existing 30-77222 Canadian Pacific steel caboose models. The CTTA member cost is $ 70.00 CDN per car including shipping within the lower mainland and Vancouver Island. With the current $USD exchange rate versus the Canadian dollar this is a real deal for our members. Features include a seated figure in the cupola, metal trucks and couplers, catwalks, chassis, metal ladders and grab rails, with a prototypical scheme including the PGE lettering ‘If it isn’t safe it isn’t right’. Car shown features 3-rail trucks and couplers. This beautifully decorated O scale Rail Diesel Car by Sunset Models is manufactured to prototypical scale length. 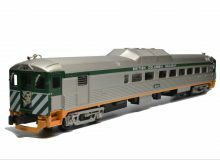 CTTA’s newest car release for hobbyists and collectors will be a set of Budd RDC-1 and RDC-2 passenger cars, produced in the British Columbia Railway two tone green colors paint scheme. This unique one-time run for the Canadian Toy Train Association will be available to order in two road numbers, in both 2-rail and 3-rail versions. Delivery is scheduled for fall 2015 with an extremely limited run of approximately 40 – 50 units. This CTTA Trailer-on-flatcar club car for 2015 complements the previously released Weaver TOFC cars. 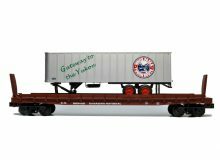 This highly detailed Weaver scale model is decorated with the road trailer in the beautiful White Pass & Yukon Route scheme and lettered with ‘Gateway to the Yukon’. 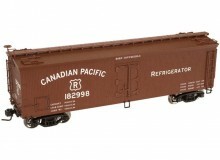 The brown wood deck flatcar is lettered with Canadian National markings. This very limited-production Weaver O gauge car comes in three road numbers for 2-rail and 3-rail operators. The combination features include metal frame, trucks and couplers; working ramps, spare tire, ladders and grab rails, and prototypical scheme. Image shows car with 3-rail trucks and couplers. 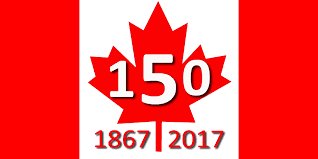 The Canadian Toy Train Association member cost is $ 80.00 CDN per car including shipping within the lower mainland and Vancouver Island. This is the same price as last year’s car, and a real deal for our members. This is the 4th car in a TOFC series. CTTA’s 2014 car is the beautifully decorated Imperial Oil 8000 gallon tanker with precise multi-colour “Made in Canada” and “Marvelube Motor Oil” markings. The model is highly detailed, and is decorated with ‘Made in Canada’ graphics. This limited-production Atlas O car comes in four road numbers, in both 2-rail and 3-rail, for collectors and operators. This car is the 3rd car in our CTTA tanker series. 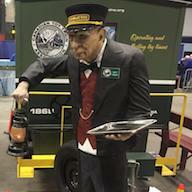 This CTTA Trailer-on-flatcar club car for 2014 complements the previously released Atlas O 11,000 gallon tanker. The Pacific Great Eastern Rail way was incorporated in 1912 and continued to operate until 1972, when it was renamed BC Rail. This highly detailed Weaver model is decorated twice over. The road trailer is in the prototypical Pacific Great Eastern orange lettering on a PGE green band on the silver trailer. The wooden deck flatcar is lettered with Pacific Great Eastern markings as well. This limited-production O gauge car comes in three road numbers, in both 2-rail and 3-rail versions. Features include metal trucks and couplers, metal chassis, ladders and grab rails. This is the 3rd car in a TOFC series. The CTTA club car for 2013 is this British American 8000 gallon tanker. This highly detailed Atlas O model is decorated in the beautiful British American Oil Company red, white and two-tone green over black colors. Our limited-production run comes in four road numbers, in both 2-rail and 3-rail. These striking cars make a great addition to any toy train, and really highlight the fine work of the manufacturers. Features include metal trucks and couplers, stainless steel catwalks, metal chassis, metal ladders and grab rails, and prototypical scheme. Image shows car with 2-rail trucks and couplers. 2nd car in a tanker series. This CTTA Trailer-on-flatcar club car for 2013 complements the previously released Atlas O 8000 gallon tanker. This highly detailed Weaver model is decorated twice over. The road trailer is in the beautiful British American Oil Company red, white and two-tone green colors. 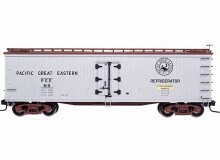 The flatcar is lettered with Pacific Great Eastern markings on a wood deck flatcar. This limited-production Weaver O gauge car comes in three road numbers for 2-rail and 3-rail operators. Features include metal trucks and couplers, metal chassis, ladders and grab rails, and prototypical scheme. Image shows car with 2-rail trucks and couplers. 2nd car in a TOFC series. 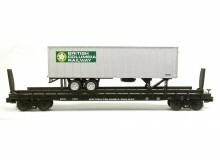 The CTTA Trailer-on-flatcar club car for 2012 is our first Weaver Trailer-on-Flatcar model. This highly detailed model has a silver road trailer decorated in the British Columbia Railway white on green with the trillium flower emblem. The wooden deck flatcar is lettered to match. A very limited-production run comes in three road numbers for both 2-rail and 3-rail operators. Features include metal trucks and couplers, metal chassis, ladders and grab rails, and prototypical scheme. Image shows car with 3-rail trucks and couplers. 1st car in a TOFC series. 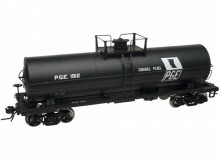 The CTTA club car for 2012 is this Pacific Great Eastern 10,000 gallon tanker with PGE graphics. The Pacific Great Eastern Rail way was incorporated in 1912 and continued to operate until 1972, when it was renamed BC Rail. This highly detailed Atlas O model is decorated in dark green and white. This limited-production O gauge car comes in two road numbers, in both 2-rail and 3-rail versions. 1st car in a tanker series. 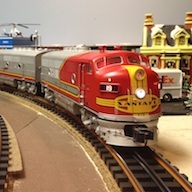 This Canadian Pacific Reefer is the 8th car in the 40’ Woodside Reefer series. Manufactured by Atlas O is this prototypical 40′ woodside reefer in the Canadian Pacific Railway colors for the Canadian Division TTOS. 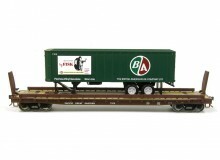 This very limited production “O” gauge reefer is available in two road numbers in both two and three rail. Car shown has 2-rail trucks and couplers. $ 75.00 US plus $ 10.00 US shipping; $ 4.00 US shipping per additional car ordered. This Bellingham Bay & British Columbia Reefer is the 7th car in the 40’ Woodside Reefer series. This ‘SPECIAL EDITION’ double sheath box car is manufactured by Atlas O. The model is a prototypical 40′ woodside reefer, and produced for the Canadian Division of the TTOS (now CTTA). 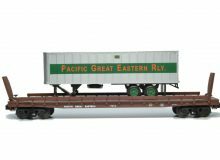 This very limited production “O” gauge reefer is available in two road numbers in both two and three rail. Car shown has 2-rail trucks and couplers. $ 40.00 CDN / 35.00 US, plus $ 10.00 US shipping; $ 4.00 US shipping per additional car ordered. This CNQ Reefer is the 6th car in the 40’ Woodside Reefer series. Manufactured by Atlas O is this prototypical 40′ woodside reefer in the Canadian Northern Quebec Railway colors for the Canadian Division of the TTOS. 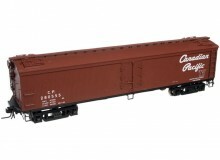 This very limited production “O” gauge reefer is available in two road numbers in both two and three rail. Car shown has 2-rail trucks and couplers. Production is scheduled for Spring 2009 with delivery during June or August 2009. Cost is $ 75.00 US plus $ 10.00 US shipping; $ 4.00 US shipping per additional car ordered. 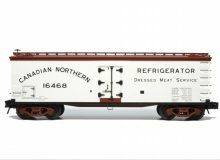 This Canadian Pacific refrigerator car is the 5th car in the 40’ Woodside Reefer series. Atlas O is manufacturing a prototypical 40′ woodsided reefer in the Canadian Pacific Railway colors. This very limited production “O” gauge reefer is available in two road numbers, in both 2 and 3 rail. Production is scheduled for Spring with delivery during June 2008. Cost is $ 65.00 US plus $ 10.00 US shipping; $ 4.00 US shipping per additional car ordered. 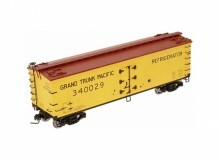 This Grand Trunk Pacific refrigerator is the 4th car in our 40’ Woodside Reefer series. Atlas O is manufacturing a prototypical 40′ woodside reefer in the Grand Trunk Pacific Railway colors for the Canadian Division of the TTOS (now CTTA). This very limited production “O” gauge reefer is available in two road numbers in both two and three rail. Image shows car with 2-rail trucks and couplers. The Grand Truck Pacific operated in British Columbia and western Canada from 1903 to 1909, when it was incorporated into the Canadian National. Production is scheduled for Spring 2007 with delivery during August. Cost is $ 65.00 US plus $ 10.00 US shipping; $ 4.00 US shipping per additional car ordered. This PGE Reefer is the 3rd car in our 40’ Woodside Reefer series. Atlas O is manufacturing a prototypical 40′ woodside reefer in the Pacific Great Eastern Railway colors for the Canadian Division of the TTOS (Now CTTA). This very limited production “O” gauge reefer is available in two road numbers, in both two and three rail. Image shows car with 2-rail trucks and couplers. Production is scheduled for Spring 2006 with delivery during July 2006. Special pricing for Canadian Division members is $ 55.00 US or $ 70 CDN if payment is received by January 31st. Add $ 10.00 US shipping; $ 4.00 US shipping per additional car ordered. Price for non-Canadian Division members is $ 65.00 US. All cars will be shipped from Washington State. This CN Reefer is the 2nd car in the 40’ Woodside Reefer series. Atlas O is manufacturing a prototypical 40′ woodside reefer in the Canadian Northern Railway colors for the Canadian Division of the TTOS (now CTTA). 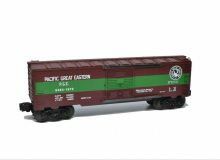 This very limited production “O” gauge reefer is available in two road numbers in both two and three rail. Image shows car with 3-rail trucks and couplers. Production is scheduled for late 2004 or early 2005 with delivery during Spring 2005. Cost is $ 65.00 US plus $ 10.00 US shipping; $ 4.00 US shipping per additional car ordered. Celebrating our 30th Anniversary, Atlas O is manufacturing a prototypical 40′ Woodside Reefer in the colours of the Canadian National Railway for the Canadian Division of the TTOS (Now CTTA). 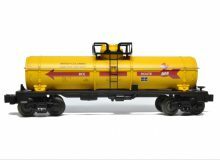 This very limited production “O” gauge reefer is available in two numbers, and in both two and three rail versions. Production is scheduled for spring 2004, with delivery expected during May or June 2004. Cost is $ 55.00 US or $ 72.00 CDN (very special Canadian Division Pricing). All cars will be shipped from Washington State. This CN Reefer is the 1st car in a series. The Canadian Division of the TTOS (now CTTA) is proud to announce our first ever ‘limited edition’, custom produced ‘Club Car’. 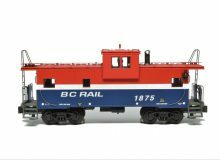 This highly detailed K-LINE Scale Caboose will be decorated in the beautiful British Columbia Railway red, white and blue colors. Features include metal trucks and couplers, interior lighting, stainless steel catwalks, operating smoke unit, opening doors, metal chassis, metal ladders and grab rails, and accurate prototypical paint scheme. 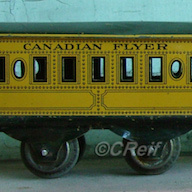 This is one of the original cars produced for the Canadian Division of the Toy Train Operating Society (TTOS) back in 2001. This is a very rare car and production quantities are unknown at this time. 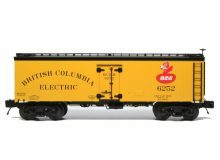 The attractive O-27 sized tank car is decorated with the yellow, white and red colours of the British Columbia Electric Railway, with black lettering. The car features die-cast sprung trucks. This is the second Lionel car produced for the TTOS Canadian Division. This is where it all began for our Club Car program! This Pacific Great Eastern ‘6464’ series style boxcar was produced by Lionel in 1996 for the Canadian Division of the Toy Train Operating Society, which is now the independent Canadian Toy Train Association. This special box car was produced with die-cast, sprung trucks and couplers mounted on Lionel’s famous and extremely popular 6464 style boxcar body. The original 30 car 6464 series boxcars, produced between 1953 and 1969, are still some of the most desirable and collectible toy trains today.